Welcome to the latest round of NHL ownership roulette. While the Buffalo Sabres seem to have found a saviour in Terry Pegula, other teams haven't been so lucky. The Dallas Stars' ownership situation could impact their ability to resign players like Brad Richards, while the Atlanta Thrashers have been mentioned as a team that could be on the move as early as next season. 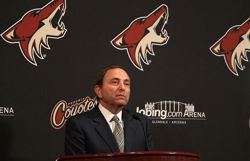 And then, of course, there's the never-ending saga of the Phoenix Coyotes. Ongoing wrangling with the city of Glendale has many predicting that the team will have no choice but to move, perhaps back to Winnipeg. It's all very frustrating, and as a fan you'd be forgiven if you were tempted to take matters into your own hands and just buy a team for yourself. And if so then you're in luck, because I've obtained a copy of the league's application form for new owners. Simply fill out the form below and send it to Gary Bettman, and soon you too could be the proud owner of your very own team. Thank you for your interest in purchasing an NHL team. As you can imagine, the process of being accepted as an NHL owner is an arduous one that involves an exhaustive examination of your background and qualifications. Are you interested in buying an NHL team? If you indicated "Yes" to the question above… uh, seriously? Wow. OK, next question: Do you have any money? ( ) No, but I am willing to pretend that I do until it's too late. ( ) Have not read an article on the economics of hockey since the 1993 Stanley Cup final. ( ) Have succeeded at everything I've ever tried; want to see what this whole "failure" thing I've heard so much about is like. ( ) Want someplace I can go a few evenings a week during the winter when I need to be alone. ( ) A judge has recently ordered me to pay half my net worth to my ex-wife; my lawyer tells me that this will be slightly less obvious than just setting a giant pile of money on fire. ( ) Have been a die-hard fan ever since the sport was invented, back on the day Mark Messier was traded to the Rangers. ( ) Have seen most of the Mighty Duck movies. ( ) Once got a blister playing the arcade version of "Blades of Steel" with the rolly ball thing. 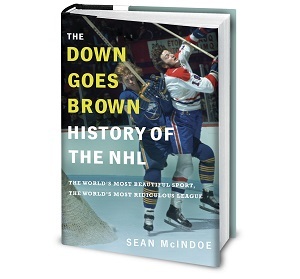 ( ) Hockey's the one with pigskin and cleats and the billion-dollar TV contract, right? Do you have an in-depth plan in place for financing a state-of-the-art arena for your team? Can that in-depth plan be summarized in its entirety as "Get the city to pay for it"? What is your ultimate goal in purchasing an NHL franchise? Hey, you're not planning to be one of those owners who writes open letters, are you? Finally, if you're reading this application form on a smart phone, what kind is it? ( ) Unreleased Blackberry prototype, since it's my company and … uh, I mean, iPhone. Haven't even read the post yet and laughing at the caption! Now to read the post! work in Phoenix" Not sure even that pinheads in that group now . No on second thought he still is. Want someplace I can go a few evenings a week during the winter when I need to be alone. I still don't think Chara deserves to be punished, it was an accidental hockey play with horribly unfortunate consequences. @Anon, Chara deserves to be punished because it was an illegal play (interference) that resulted in a serious injury. If the play was legal, then you could call it a hockey play. As it is, it's no more a hockey play then slashing or elbowing or boarding; sure, you could do one of those to send a message to a rival half way through a blowout, but if you break the other guy's spine while doing it, we refer to you as "Mr. Bertuzzi". It's just like breaking a traffic law. If you run a stop sign, it’s not such a big deal. Maybe it was late, and nobody was there, or something like that. But what happens if you run a stop sign a hit someone. There’s no intent to hit a pedestrian, and the action that you did, while wrong, wasnt such a big deal. The endgame, though, is that someone is in the hospital with a fractured spine and a concussion. can your plan be summarized in its entirety as "get the city to pay for it?" That's some good stuff right there. Had me laughing from start to finish! Well done, Sir! These are great but I would love to see more Leafs commentary, especially in the heat of a playoff race!!! If the play was "legal" why was there 65 minutes of penalties associated with it? The cold hard truth is that this play was *The* textbook example of interference and ultimately was the root cause of a kid getting his neck broken. It wasn't the stanchion's fault. It wasn't Pacioretty's fault. It WAS Chara's fault. I'm not a Chara/Bruins hater and I'm not a MP/Habs hater... I'm just calling it as I see it (and as the refs saw it). MP was pushed/rode into the stanchion by Chara who was making an illegal play and MP got his neck broken. Chara deserves to be suspended.